Tragal cartilage graft is taken from the tragus region of the ear. Gubiesch and Kotzur in a three year study reported in 2003, using tragal cartilage grafts in 84 cases none experienced donor site morbidity. They were able to harvest grafts up to 1.5cm by 1.5 cm in size. The advantage of tragal cartilage over conchal cartilage is that it is flat and less elastic. The authors consider it, therefore, to be the ideal graft for augmentation of the dorsum, compensation of irregularities, or correction of open roof deformities. 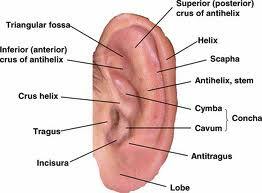 They also claim that the tragus is easily accessible, as a donor site. In another 2007 study Cochran and Defatta determined that the tragus provides a simple, convenient alternative source of cartilage for rhinoplasty in graft-depleted patients. Tragal cartilage grafts were used in three primary and three secondary rhinoplasty patients. Postoperative follow-up ranged from six months to 12 months. Tragal cartilage was used as five alar contour grafts, one lateral crural onlay graft, one dorsal onlay graft, and one infratip lobule graft. Tragal cartilage was used to close the septal perforation of one patient. Tragal contour was preserved in all patients, and there were no complications noted with this procedure. One study did find a negative side effect to use of tragal cartilage removal. Pothier D.D & Charaklias N. in 2006 study showed ten of the 12 patients in the tragal harvesting group who had used " in the ear"earphones pre- and post-operatively had had problems with earphones post-operatively, which in eight cases were due to pain or the devices falling out. Of the 12 respondents in the non-tragus group, only one had similar problems (p<0.05).